ENLARGEMENTS AVAILABLE FOR SOME PHOTOS ON THIS PAGE. 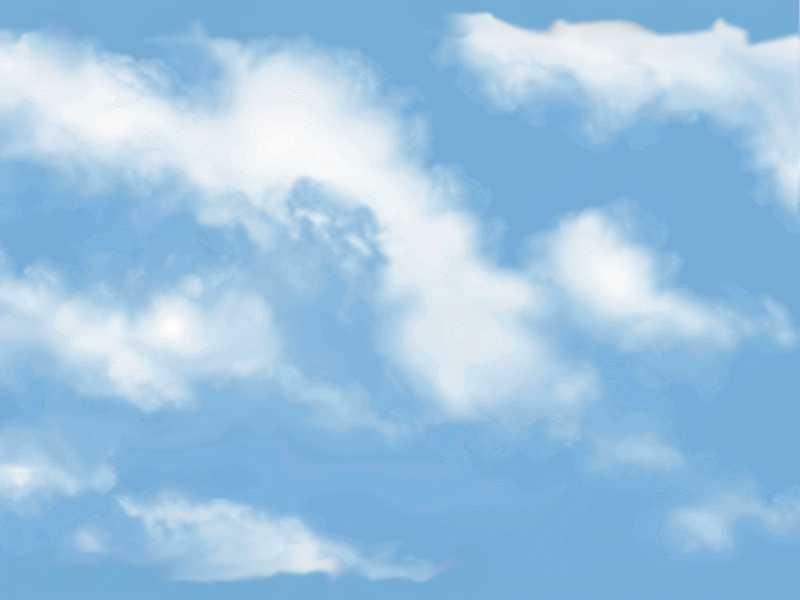 CLICK THE PICTURES, ENLARGEMENTS WILL OPEN IN NEW WINDOWS. 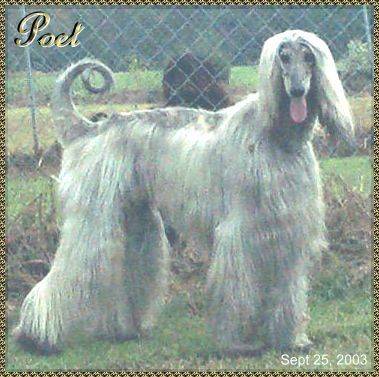 Poet is an exceptionally beautiful purebred Afghan Hound dog. He was 5 years old on August 8th, 2003. 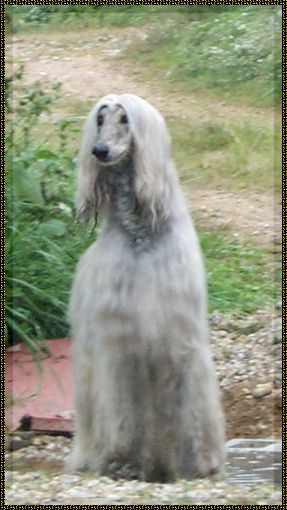 He is mature, and as the Afghan Hound is usually a late maturing dog, he's just into the prime of his life. He is trained and very well mannered in the house. 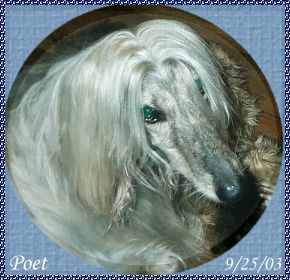 On October 4th, 2003, Poet went to live withMr. Donovan Kight in Raleigh, NC. He is a most decorative 'couch ornament' : ). 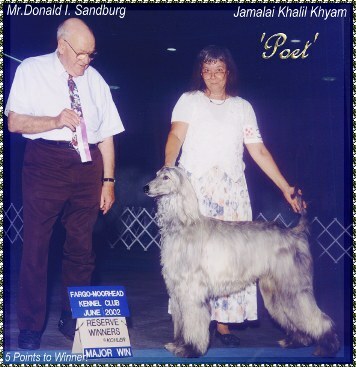 His talents and temperament are suitable for participation in Junior Handling - he LOVED the show ring, possibly obedience or agility; and he would certainly make a wonderful & exotic therapy dog, as he is VERY sweet. He hasn't shown much prey drive at all, so Poet will probably never be a lure courser. 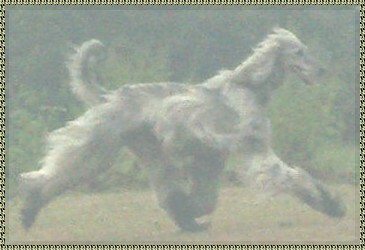 He is often allowed to run loose here on our 300 acre farm, as he is very well behaved, and we live far from roads. He has never bothered our barn cats, nor our chickens, and he even comes in when called! 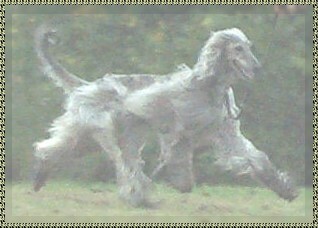 (unusual for this breed : ). He will get along with small dogs, so long as they aren't overly aggressive toward him. 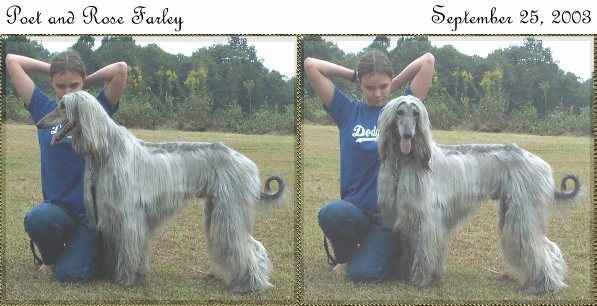 He gets along well with all our other Afghan Hounds, except for our most dominant male. Poet is very calm & laid back. He never starts anything - but he won't take any 'stuff' either. His best buddy here used to be one of our other males, Moses. He & Moses would always share our Lazy Boy love seat, play with toys, and even both get into our largest crate (door open all the time) and nap together. 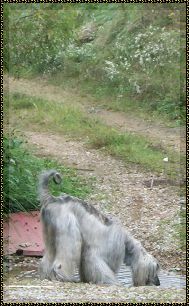 <== AFTER HIS EXERCISE, POET ENJOYS A DRINK FROM OUR SPRING. 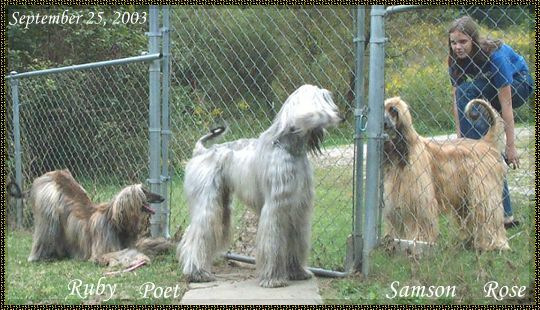 Poet has been wonderful with our four children who are still at home (we have 6). Of course, they treat him with respect. Poet's color is called 'silver blue brindle', also sometimes called 'oyster shell' brindle. He's a very light cream/nearly white, with stripes of gray ('blue'). Although not rare, it's not a common color either. He is not clipped, and there's no reason (on his part) he couldn't still be a show dog. He loves to play with stuffed squeaky toys (or the ones that 'grunt'! ), lie on the couch, go for walks, and have his ears 'mooshed'. The ideal person for him is someone who will love and spoil him, and take pride in his gorgeous looks. Call or Email anytime - I love to talk about the dogs! Call to inquire about availability of puppies. 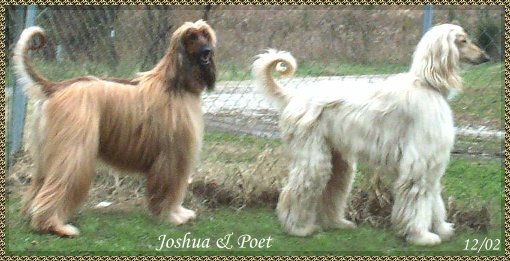 Hosanna Afghan Hounds use only J-B Almond Concentrate Shampoo, and we HIGHLY recommend it! J-B consistently has the best prices and best selection we can find for dog and show supplies. as well as much of the world still have SLOW PHONE LINE internet access. If your monitor is set to higher resolution, our big pictures will look small on your screen. and take forever to download at 28kb (or 26kb, which is what we usually have here). 800x600 TRUE COLOR. The pages will fit your screen perfectly at that setting.